In the US we tend to think of John Singleton Copley, John Smibert, and Charles Willson Peale when the words “colonial art” come up. There is, however, another rich and fascinating world of colonial art in Central and South America, areas conquered by the Spanish. Like the American colonies, these areas imported the styles current in Europe in order to suit the tastes of affluent art patrons. One reason I find Spanish colonial art so interesting is because of its affinities to what was going on with art in Spain, and the way Spanish colonists (who often intermarried with the native people) viewed themselves. DID YOU KNOW that the Brooklyn Museum of Art (rapidly becoming one of my favorites in this country) has been advocating the study of Central and South American and Native American art since the 1930s? In 1941 alone the BMA acquired 1400 objects from Latin America. That said, the Ponce Museum in Puerto Rico has an equally impressive collection of Spanish colonial art. Archeologists have found traces of human settlement on Puerto Rico dating to at least 2000 BCE. Between the 7th and 11th centuries CE an Arawak Indian culture developed: the Taino. The Taino were the dominant culture by the year 1000. Columbus encountered the Taino when he landed on the island in 1493. By 1508 the island had been colonized by the Spanish. The Spanish forced the Taino into slave labor and their culture was soon decimated by diseases introduced by the Europeans. The Spanish began importing African slaves in the 18th century to replace the dwindling Taino culture. Campeche was the son of an African slave who bought his freedom and a white mother. He rose to become the most celebrated Puerto Rican artist of the eighteenth century, and the first internationally renowned Puerto Rican artist. His father worked as a gilder, decorator, and painter, from whom Campeche most likely learned how to paint. Although he could not afford to go to Spain to learn current styles, he was able to adapt the Spanish Rococo style from the Spanish exiled court painter Luis Paret y Alcázar (1746-1799). Campeche’s palette lightened and his drawing became considerably more fluid and refined after 1775, the first year of Paret’s exile. He may have even assisted Paret in religious commissions for the Cathedral of San Juan. This work definitely has affinities to the Rococo period of Francisco José de Goya y Lucientes. Campeche achieved renown in many areas, including architecture and music. He even designed fireworks celebrations and funeral corteges. Although he painted many religious scenes, he is most famous for his portraits of the elite of Puerto Rican society. As with portraiture in mainland Spanish colonial cultures, wealthy Puerto Ricans emulated their European counterparts. This portrait of a wealthy young woman has all the allusions to refinement and status of Peruvian and Mexican portraits of the period. It reflects the Spanish Rococo style as seen in the court portraits of such Spanish artists as Goya. The portrait is one of five depictions of “amazonas,” or women riders by Campeche. 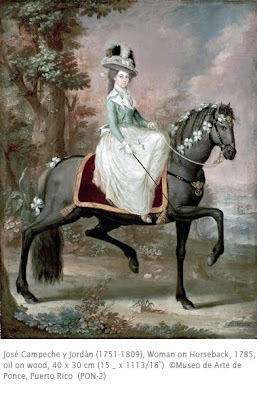 Such young women were renowned as accomplished riders in yearly riding competitions. Learn more about Spanish colonial art in the Early American Masters set from Davis.